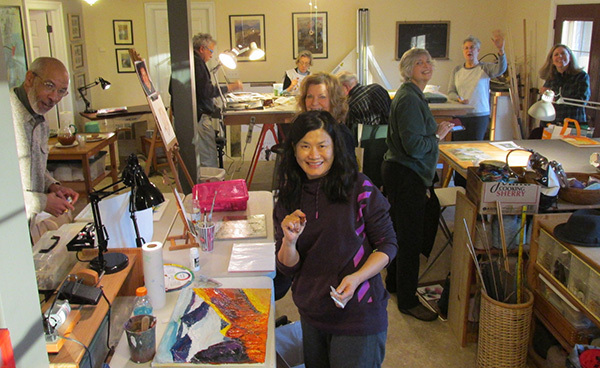 Rebecca now offers a class in her studio every first Sunday of the month from 2 to 5. The cost is $25 a class and you are asked to commit to 4 classes at a time, which do not have to be consecutive. The format for what is called the Drawing and Painting Group is as follows. Everyone brings his or her own materials and project to work on. Rebecca coaches each student individually on whatever help is needed. The class ends with a “critique” and everyone is invited to show work, talk about it and get feedback. 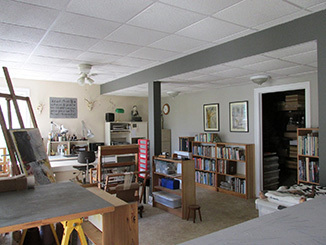 Each student has access to an extensive art library and a variety of equipment and materials with which to experiment. In good weather, the outdoors around the studio offers beautiful views as a subject for any medium. It is a great group of encouraging and supportive people. Everyone is welcome. Rebecca offers private lessons at her home studio or yours. You bring whatever you want to work on, and she will work with you, demonstrating techniques step-by-step so that you can follow along. Sessions are $75 for 90 minutes.